The currencies of Asian emerging markets that trade heavily with China fell sharply after Beijing devalued its currency, as investors bet a weaker yuan will add to pressures on their deteriorating economies. Investors have pushed the currencies of South Korea and Malaysia down over 2% in the past two days, making them among the biggest losers globally since China devalued the yuan, which has fallen as much as 3.7% over the same period. 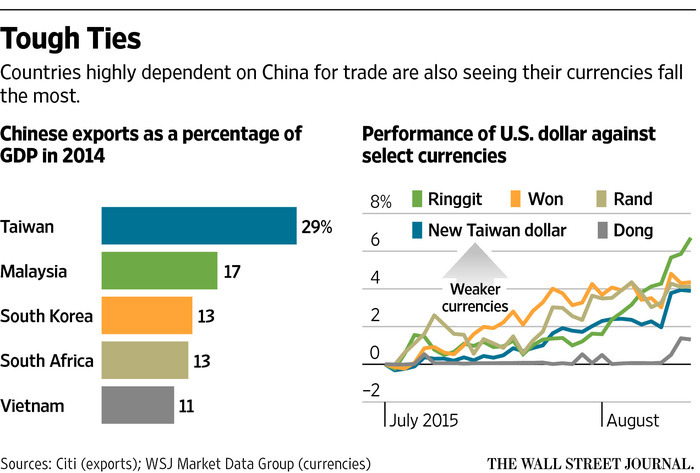 In recent days, Vietnam and Taiwan have engineered drops in their currencies. These nations’ exports to China are worth over 10% of their gross domestic product, making them dependent on Asia’s largesteconomy to fuel economic growth. While other countries that trade with China, like South Africa and Brazil, have seen their currencies decline in recent days, some of the biggest losses have been in Asia. For years, Asian exports grew at double-digit rates but are now barely eking out growth. Chinese imports have already been weakening due to the slowing economy—a weaker yuan exacerbates the pain for exporters as it makes goods more costly for Chinese consumers. As the currency declines, Chinese consumers could turn more toward locally made brands. Chinese makers of cellphones and other consumer products also get an edge in global markets over North Asian rivals. Analysts say the yuan’s decline could force many of the exposedeconomies to push their currencies down further to make exports more competitive, adding to negative sentiment on their currencies. “The fear now has increased about currency wars and the potential negative economic pressure from decreased exports”, said Matt Lloyd, chief investment strategist at Advisors Asset Management based in Colorado. The yuan’s devaluation has added to growth headwinds in emerging markets due to China’s slowing economy, a deepening slump in commodities, waning global growth and expectations the U.S. will raise interest rates this year. A lack of economic reform in many developing nations also has hurt investors’ sentiment. Countries have tried interest-rate cuts and fiscal spending to aid their economies, but growth in many places has continued to sag. That has made weaker currencies a last resort, including for China. Taiwan this week responded to China’s devaluation by reducing the rate it pays commercial banks for overnight deposits, a move which pushed its currency down 2% in two days, its biggest loss since the global financial crisis. Vietnam widened the band in which it allows the dong currency to trade, leading to a 1.2% loss over the last three days. Taiwan’s exports to China are worth 30% of its economic output due to its reliance on selling intermediary goods like semiconductors to finished items such as packaged foods and machinery. Exports tumbled 12% on year in July, largely due to a drop in shipments of petrochemical products to China. South Korea saw the won pushed to its weakest in four years, down 2% over the last two days and 8% lower since the start of 2015. More than a quarter of South Korea’s total exports go to China. Abroad, the country faces competition from China on a range of low end to high end tablets, cellphones and other electronics. For commodity exporters like Malaysia and Vietnam, the concern is that a weaker yuan increases import costs for Chinese consumers of products like rubber, coal and iron ore, further undermining demand. Weaker currencies are supposed to make exports more competitive in global trade, but if they fall too far, they start presenting challenges domestically and are rarely a source of good news. Malaysia’s ringgit fell 2.7% in the two days after China’s move, and is down 15% this year. A weaker currency could help the country’s commodities and electronics exports to China, but the nation’s central bank is worried the fast pace of declines doesn’t represent the underlying economy and could spur capital flight. In South Africa, a decline in the rand has led to inflation problems and the central bank last month was forced to raise rates, compounding its economic slowdown. Officials in Indonesia, another big commodity-exporter, have voiced concerns in recent days about weakness in the rupiah, which is at its lowest level since the Asian financial crisis of the late 1990s. “All markets have been under pressure because of worries about competitive devaluation,” said Jean-Charles Sambor, Asia Pacific director at the International Institute of Finance. “All emerging market countries are more dependent on China’s economy than they were 20 years ago”.